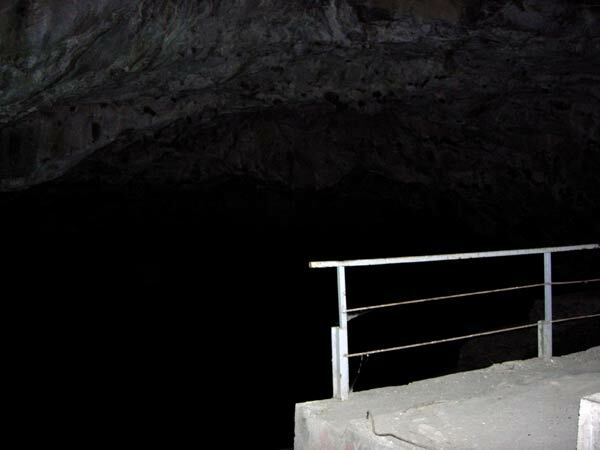 Although the cave on a first visit usually looks quite normal and un-mysterious, repeat visits tend to stimulate the imagination & strange things do seem to happen there. 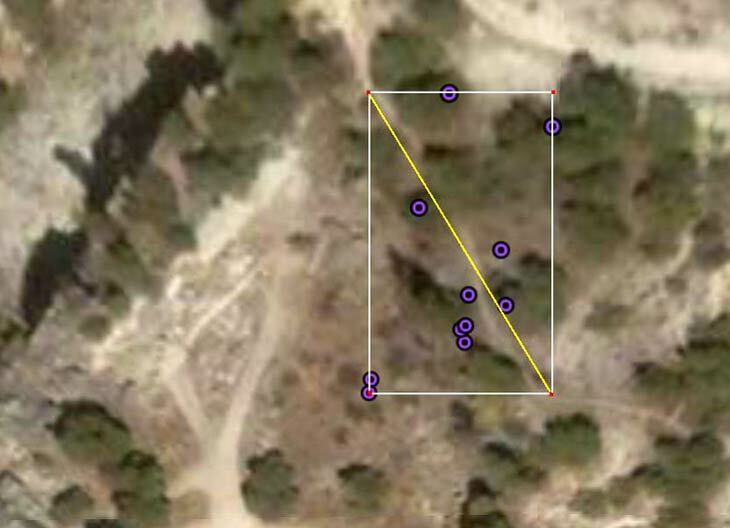 One of the things I have noticed is that it is difficult to obtain repeatable GPS satellite position fixes near the entrance to the cave. Below is a Google Earth satellite image with a a set of Garmin Etrex handheld GPS receiver positions overlaid. The GPS indicated it was getting a good fix on each of the recorded positions. The diagonal is 54 metres! An attempt to photograph the bats flying in and out of the cave as the sun set (same day as above) produced this puzzling photograph (taken with a Nikon Coolpix E5200 5-Megapixels digital camera) - which actually caught the bat in flight. 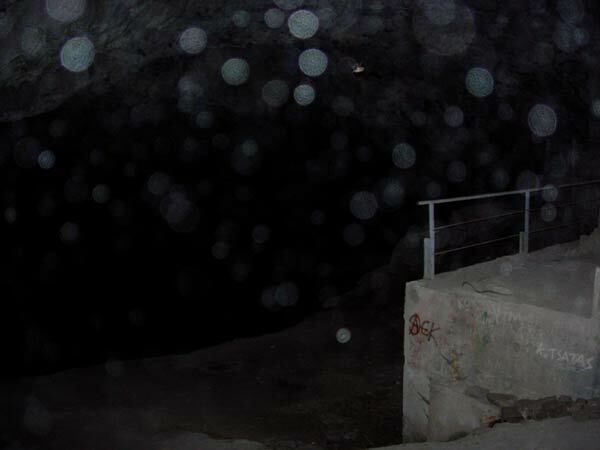 Nothing unusual was visible during the actual photographing except bats fluttering in and out of the cave entrance. NOTE: The original untouched photo (1.75 Mbytes) can be downloaded by double-clicking the above photo. The same photo with mid tones enhanced. The bat is the bright spot at the top. 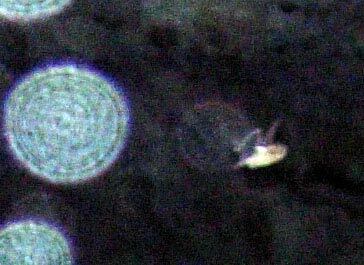 Here the bat has been cropped from the main photo & the resulting image colour-enhanced. The bat is caught by the camera flash in mid-air. This was the first time that an effect like this had occoured in 1,300 photos with this camera and had me quite mystified. This photo was taken a few seconds later (at 8.47 and 20 secs pm) in an attempt to photograph another bat. No strange effects can be seen. CONCLUSION: It is probable that the effect was caused by a reflection of the camera flash in the bats eye. According to the website of the The Association for the Scientific Study of Anomalous Phenomena (ASSAP) the effect is most probably "lens flare". QUOTE: "Lens flare is caused by reflections within the camera lens. Camera 'lenses' actually consist of several lens elements which is why they are cylindrical. Lens flare occurs when there is a bright light source in the frame or just outside it." "Lens flare does not require flash, just a light source. 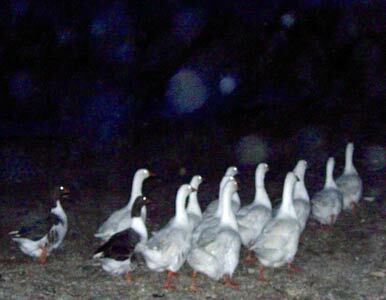 However, you can get flare with a flash photo if there is something highly reflective nearby that can act as a light source (reflecting back the flash)"
But then a month later I had another another case of lens-flare caused by the reflection of the camera flash in the eyes of a group (gaggle) of geese taken with the same camera on a dark beach on the Island of Paros on 27th Sept. 2008. Note the strong reflections from the bird's eyes. I and 3 other witnesses saw clouds (or mist) swirling in an amazing vertical circular motion near the entrance to the cave in December 2007. More material will be added to this section as it is compiled / discovered.